There are some teachers who give nearly everybody an A or a B. Car safety advocate Jack Gillis thinks the federal government is doing the same thing with cars. As Gillis puts it: "97% of 2015 models earn a 4- or 5-star crash test rating from NHTSA (the National Highway Traffic Safety Agency). So how do you know which are truly the best performers?" One way is to consult the Gillis Crash Test Index, which breaks down ratings in much more detail than just 4 or 5 stars. As for why this is necessary, Gillis says that in a side-impact crash, the driver of a Ford Fusion is six times as likely to sustain a life-threatening injury as the driver of a Subaru Outback -- yet they both have 5-star crash test ratings. Gillis says that's because NHTSA’s crash test program only requires cars to pass certain benchmarks, rather than compare vehicles on a relative basis, making it impossible for consumers to identify the true best and worst performers. The Gillis Crash Test Index works by taking the raw crash test data from the government and compiling it to come up with scores for the front and side crash tests. These scores are then compared on a relative basis so consumers can see which cars are truly the top performers in the front, side, and combined crash tests. For example, while both the Chevrolet Equinox and Lexus RX have 5 star side safety ratings, the driver of an Equinox is over 4 times more likely to sustain a life threatening injury. The Gillis Index makes this distinction clear with the Equinox receiving a “Very Poor” side crash test rating and the RX receiving a “Very Good”. Furthermore the RX receives an overall crash test rating of 5 while the Equinox gets a 2 ensuring that if safety is your primary concern, you know what choice to make. All of this is explained in much more detail in "The Car Book," which Gillis publishes annually in conjunction with the Center for Auto Safety, a Washington non-profit. Gillis likes to say the book was once banned by the U.S. government. That happened back in 1980, when Gillis, who worked for NHTSA at the time, helped publish the first edition. The book quickly became the most popular title published by the government but it annoyed automakers, who put pressure on the Reagan Administration to deep-six it. Sure enough, the government killed the book, Gillis left NHTSA and the book is now published annually using publicly available data. For the 35 years since then, The Car Book has been guiding consumers to the safest and best-performing vehicles. In the book, Gillis provides his detailed safety ratings as well as information on maintenance costs, reliability and other factors that influence buying decisions. 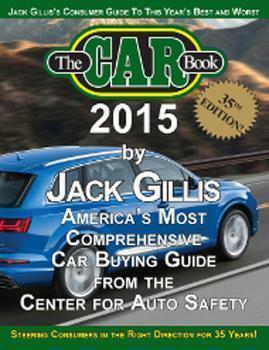 You can order The Car Book 2015 online at the Center for Auto Safety's site.